WYSE Travel Confederation will be hosting a number of think tanks throughout the World Youth & Student Travel Conference to bring the youth travel industry together and discuss the issues affecting business. WYSTC Think Tanks provide the framework for organised debates on the future of youth & student travel and tourism. The aim is to create an instrument for identifying, discussing and appraising influential and formative developments and trends and then communicating the outcomes to relevant authorities and to our members. 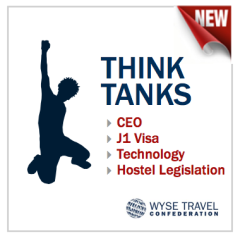 The think tanks are by Invitation Only and attendees comprise of both WYSE Travel Confederation Members as well as suppliers and industry experts. WYSTC Think Tanks provide the ideal platform for dialogue within the youth & student travel and tourism industry. The WYSTC CEO Think Tank will welcome representatives from the leading youth & student travel organisations for a structured debate on the latest trends and industry research. The primary objective of the meeting is to analyse the state of the youth travel industry in the current year, discussing the latest research, providing short and long-term outlooks for all major youth travel industry sectors, and to advise on how to scope youth & student travel and tourism in the face of global trends. Technology innovation is rapidly driving developments within the youth & student travel industry. This Technology Think Tank will engage with the key players behind these technological developments to review how technology can help drive positive developments within the industry. Following recentdevelopments in Washington on the immigration reform bill and its impact on the J-1 Visa situation, this group will discuss the current state of play and how to best prepare for future developments. Legislative developments within the hostel market are not keeping pace with the rapid investment into youth travel accommodation. Hostelworld’s recent significant lobbying efforts in New York City highlight the need for a concerted group effort to ensure legislation does not hamper investment. What can the leaders of the industry do to ensure this? The WYSTC Think Tanks are by invitation only. If you are interested in attending one of the think tanks please complete this brief form. White Paper reports will be produced after each think tank. For your reference, the White Papers from the 2013 series of think tanks will be available on this website for download after WYSTC.